OTTAWA -- When the Buffalo Sabres were on the verge of taking over first place in the NHL, their fans inside KeyBank Center chanted, "We want 10." Perhaps more troubling than the result, Buffalo (31-36-9) has the fewest points in the NHL since it sat atop the league's standings on Nov. 28, and it became the first team to lose 13 consecutive road games since the 2003-04 Chicago Blackhawks dropped 16 straight. The Sabres have been shut out four times in their last nine games and they have only three wins over their last 20 games, dropping 11 of their last 12. They have not won back-to-back games since Dec. 13, and were officially eliminated from playoff contention with a 7-4 loss Saturday in Montreal. They were the better team with 46 shots during a 3-1 loss in New Jersey on Monday, only to respond with one of their ugliest losses of the season. The Senators (27-43-6) had a recent stretch of 18 losses in 22 games and traded their two best players before last month's deadline. Yet, the Sabres flew back to Buffalo with only one goal in two games: Sam Reinhart's dump-in that bounced over Cory Schneider's leg pad in Newark. They had few quality chances against Ottawa, despite having more shots (35-31) and shot attempts (65-51). The Sabres have shown little progress without the puck, despite only six games remaining in the regular season. 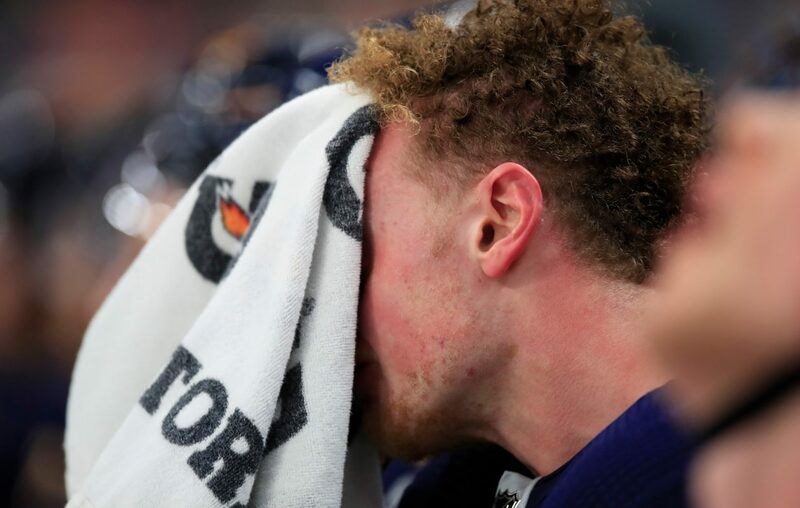 Buffalo crumbled after it had the game's first five shots, and the problems began when no one covered Anthony Duclair, who was allowed to collect a rebound near the crease and shoot the puck past Carter Hutton for a 1-0 lead at 17:07 into the first period. "We all have to be accountable," Eichel said. "We have to hold each other accountable. It’s critical mistakes that we make every night. That’s it. You watch the games. You see it. Everyone has to be better. This is the National Hockey League. We’ve got to be better. Myself. Everybody. Everybody has to be better. We can’t go out there and play like that and expect to win." Brian Gibbons gave the Senators a 2-0 lead with 11 seconds left in the first period, when he snuck behind the Sabres' defenders and one-timed a backdoor pass from Christian Jaros into the open net. Following a scoreless second period, Housley's players had one of their worst 90-second sequences in weeks. With the Senators on the power play, Bobby Ryan collected the puck at the right point and passed down low to Rudolfs Balcers, who was left alone in front of Hutton and had seconds to stick-handle before shooting the puck into the back of the net for a 3-0 lead at 5:54 into the third period. "I just thought we stunk," Housley said. "We stunk up the building tonight. ... That’s not winning hockey." Magnus Paajarvi then scored on a 4-on-2 odd-man rush that began with Evan Rodrigues falling down in the offensive zone and his fellow forwards -- Tage Thompson and Jason Pominville -- taking too long to realize that Ottawa had regained possession. Okposo grimaced when informed by a reporter that his teammates stopped skating on the play, while Housley disagreed that lack of effort was an issue on the goal. "Yeah, I don’t know what to say," Okposo responded. "This is the best league in the world and every time you get on the ice, whether you’re a first-line guy, fourth-line guy, third pair D, backup goalie, you have to respect the fact you’re in the National Hockey League and you’re fighting for jobs. ... I just don’t think we have that sense of urgency every time we step on the ice. We’ve got six games left. We have to show some emotion. We’ve got to play. We’ve got to play." As the Sabres were amid a promising first five minutes, their owners, Kim and Terry Pegula, spoke to reporters at the NFL Owners Meetings in Phoenix. Their team was losing by two goals by the time their annual media availability ended. Both deflected questions about any possible changes, including Housley's future, but they expressed disappointment in the team's performance. The team's captain thinks the blame should be spread around the dressing room and wants the focus to turn to Thursday's game at home against Detroit. "It shouldn't be in any of our minds and if it is then you have a problem," he said of possible changes. "We have a game in two days against Detroit. … We all have to better. It starts with me. I have to be better. I’ve got to start leading better and it [stinks] that we’re in this position, but [the Senators] don’t feel bad for us. Detroit isn’t going to feel bad for us."